The oceans of the world are under serious pressure. An eye-opening new report has documented plummeting populations of marine life across the globe. The Living Blue Planet Report, prepared by the WWF and ZSL, has analysed over 1200 species and highlighted these terrible losses to marine populations in recent years. Figures indicate a loss of 49% in some species, since just 1970. Tuna and mackerel – popular food species – fare even worse, with populations down 74%. Sea cucumbers, too, are on the menu. Seen as a delicacy, particularly in Asia, they have been harvested to the brink. They are vital to marine ecosystems for the role they play in regulating water quality and feeding on detritus, yet their numbers in the Galapagos have dropped by 98% since 1993 – when the first legal fishery opened. In the Egyptian Red Sea, the figure is almost as high, with sea cucumber numbers down by 94%, again due to over-exploitation. Tuna, mackerel, and sea cucumbers obviously aren’t alone in having their populations decimated. One in four species of sharks and rays is now threatened with extinction, primarily due to overfishing. Four species of sea turtle – hawksbill, Kemp’s ridley, green, and loggerhead – are listed by the IUCN as endangered or critically endangered, with leatherback and olive ridley turtles classed as vulnerable. Coral reefs, mangroves, and sea grass meadows are three incredibly important habitats that support myriad marine life, and all three are suffering. Coral reefs are rich habitats – an estimated 25% of all marine species live in them – yet they are widely reported to be threatened by all manner of impacts, from human development to ocean acidification through climate change. Sea grass provides a nursery to many fish, and a home to many invertebrates. Total coverage of sea grass meadows has dropped by 30% in the last century. Mangroves benefit both marine life and coastal human populations, and it is now reported that 20% of mangrove cover has been lost since 1980. 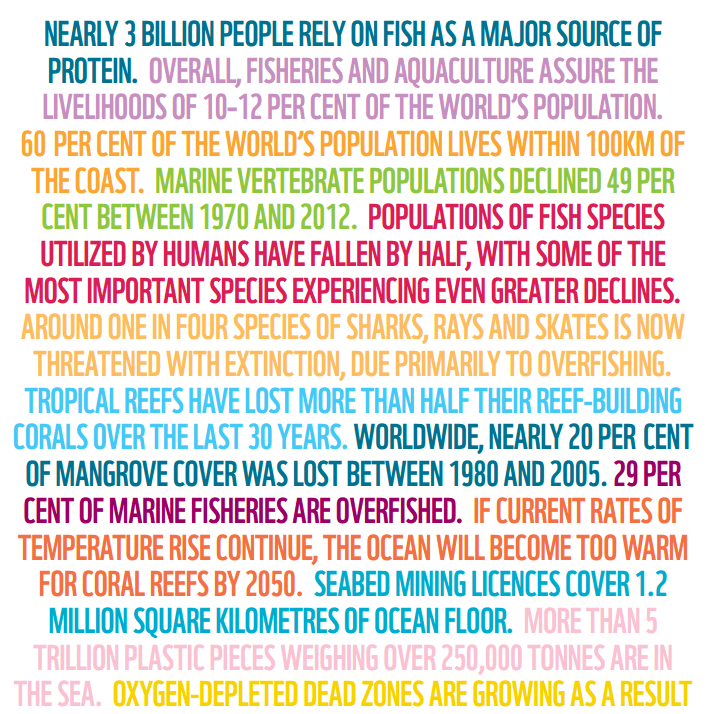 For more information, details, and reference, the full Living Blue Planet Report is available.